The ECB first announced its targeted long-term refinancing operations (TLTRO) in summer 2014, and operations started in September 2014. Under the first version of the programme, banks could borrow an initial allowance of 7% of their outstanding loans to the euro area non-financial private sector. They could then borrow additional funds in a second wave in March 2015 and June 2016, depending on their net lending to the real economy. ECB President Mario Draghi said on March 10 that the TLTRO has been successful. 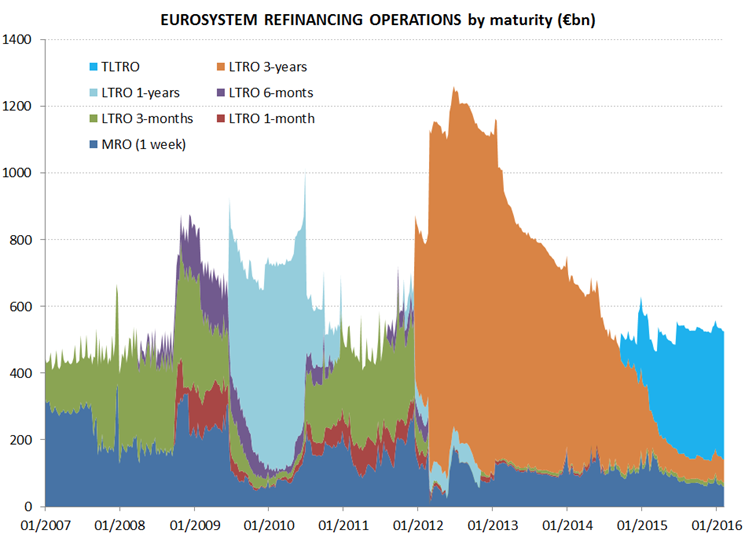 In terms of total outstanding ECB liquidity (figure 1), TLTROs have substituted for part of the liquidity drained by the redemptions of 3-year LTROs, keeping the total liquidity allocated through refinancing operations above 500 billion euros. When looking at how the funds have impacted the real economy, the picture is mixed. Euro-area banks’ loans to non-financial corporations and households started to fall in 2012, and TLTROs appear to have stopped this decline. Since 2014 the stock has remained constant, but the programme has not managed to put us back to a high growth path of lending to the real economy. TLTRO 2.0 will be conducted in 4 quarterly operations in June, September and December 2016 and in March 2017. Banks will be allowed to borrow an amount equivalent to up to 30% of their outstanding eligible loans on 31st January 2016, net of the funds from the previous TLTRO that they may still need to repay. Assuming that there were no funds outstanding when the first operation of TLTRO 2.0 takes place, then euro-area banks could borrow up to 1685 billion euros under this new programme. This assumption is reasonable as the ECB will allow banks to repay the old TLTRO in anticipation of the new programme starting. Again, allocations vary significantly across countries with Germany, France, Italy and Spain having the largest shares. The most important change is to the structure in terms of leveraging and incentives. The initial interest rate applied to TLTRO 2.0 will be fixed for each operation at the rate applied in the main refinancing operations at the time of allotment (currently 0%). However, banks whose net lending between 1 February 2016 and 31 January 2018 exceeds a certain benchmark will be charged a lower rate for the entire term of the operation. This lower rate will be linked to the interest rate on the deposit facility at the time of the allotment of each operation. This is currently negative, meaning that for some banks, borrowing under the TLTRO 2.0 could effectively take place at a negative rate. Banks will receive the maximum rate reduction if they exceed their benchmark stock of eligible loans by 2.5%, as of 31 January 2018. Up to this limit, the size of the decrease in the interest rate will be graduated linearly, depending on the percentage by which banks exceed the lending benchmark. How easy will it be to reach this benchmark? Based on the published details, it should not be very difficult. For banks whose net lending to firms and households was positive over the 12-month period to 31st January 2016, the benchmark for net lending is set at zero. So these banks would qualify for borrowing at negative rates as long as their net lending through 2018 remains positive, even if very small. For banks whose eligible net lending was negative over the 12-month period to 31st January 2016, the benchmark for net lending is equal to the eligible net lending in that period. This means that banks could qualify for negative borrowing rates if they reduce the rate at which their lending is decreasing, without achieving positive net lending. These conditions are the same as under the previous version of the programme, but it goes without saying that prize is higher now: a negative borrowing rate. Figure 4 shows which countries exhibited positive and negative net lending over the period considered. Will this measure be effective? Some have argued that that the ECB will just boost banks’ profits by allowing them to borrow at negative rates. It is worth pointing out that in a context where liquidity is abundant, the ECB automatically makes a profit by having a negative rate on the deposit facility and on the amounts of banks liquidity in excess of reserve requirements. By having a negative borrowing rate on TLTROs, the ECB basically returns part of that profit to the banking sector. The relative balance for each bank will obviously depend on how much excess liquidity it has deposited compared to how much it lends. When banks borrow via TLTRO this creates an equal amount of reserves at the ECB (unless the funds are converted into cash). On the reserves in excess of the minimum requirement, banks have to pay the same rate as on the deposit facility, i.e. -0.4%. The negative borrowing rate on TLTRO would act as compensation for the rate paid on excess reserves. If banks increased their lending enough to get the full interest rate discount on their TLTRO 2.0 borrowing (i.e. a rate of -0.4%) the two effects could be compensated. Another element of this new programme could be more problematic. The previous version of the TLTRO included a mandatory requirement for banks to return the funds they had borrowed, in case they did not reach their lending benchmark. TLTRO 2.0 on the contrary does not foresee any such mechanism. The reason for this change is unclear.It appears to contradict the rationale behind TLTRO lending, because those banks that do not increase lending to the economy would still be able to access plenty of liquidity at the 0% main refinancing operations rate without constraints. President Draghi might have dropped a hint during the press conference, when he explicitly remarked that TLTRO 2.0 provides funding certainty, at an attractive price in an environment where volatility is high and there are high upcoming bank-bonds redemptions. But while banks will certainly benefit from having liquidity available at negative rates in a potentially turbulent period for bond issuance, the rationale behind TLTRO lending was different. The whole idea (quoting from the ECB itself ) was to “enhance the functioning of the monetary policy transmission mechanism by supporting bank lending to the real economy”. By offering liquidity at negative rates, but eliminating completely the requirements for banks to return the funds when they do not achieve their lending benchmark, the ECB may in fact be weakening the link between the provision of central bank liquidity and lending to the real economy that was at the centre of the TLTRO idea.